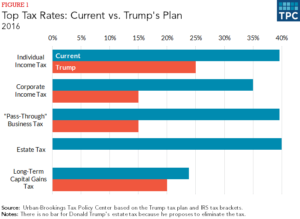 Most analyses of President Trump’s new tax proposal focus on the supposed audacity of cutting the corporate income rate to a maximum of 15 percent – but those analyses miss the mark. Trump’s proposal is not audacious enough. What lawmakers should do is completely eliminate the corporate income tax. Period…. The economic-growth effects of these changes would be enormous. Not only would net profits (in other words, post-tax) jump by an average of between 14 and 23 percent (and as much as the top federal rate of 35 percent), but the repatriation of a huge portion of $2 trillion held abroad plus the influx of foreign investment would both be immense. The immediate boost to effective profits must manifest itself in varying combinations of three ways. First, some of the profits would go to shareholders, who would pay into the treasury at the somewhat higher top tax rate of 25 percent, paid on greater total profits (both ways helping the treasury), or whose corporate executives would reinvest in their businesses in non-accountant-heavy ways. Note: Plenty of these “shareholders” are actually pensioners, whether through private or government-backed funds, all of which would immediately be shored up – thus helping ameliorate the growing problem of unfunded pension liabilities. Third, with effective profit margins being so much higher, the market would ensure that part of the effect would be downward pressure on prices, so consumers, too, would benefit immensely.